The iPhone 6S Plus will offer stronger construction than the original, based on a rear casing component that is making the rounds online. The iPhone 6 and iPhone 6 Plus were smash-hit handsets, although the latter was embroiled in controversy on release, namely the Bendgate fiasco. Many customers reported that their supersize iPhone 6 Plus handsets were bending in their pockets. Thankfully, it appears that Apple has ensured it won't happen again on the iPhone 6S Plus. Future Supplier has apparently got hold of the rear shell for the next-gen phablet, noting that it feels “smoother” and “stronger” than last year's model. The details align with claims made last month by well-connected analyst Ming-Chi Kuo of KGI Securities. Kuo revealed that the iPhone 6S Plus will feature the same 7000 Series aluminium currently found on the Apple Watch Sport — an alloy said to be 60 per cent stronger than most aluminium, with just one-third the density of stainless steel. 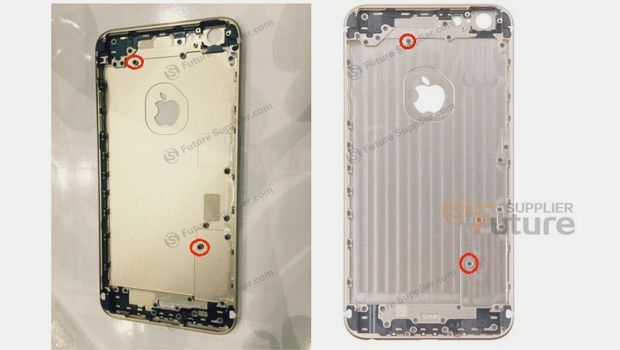 The new and improved shell also backs previous reports suggesting the iPhone 6S will be thicker than the iPhone 6. According to schematics leaked earlier this month, the 6S will be 7.1mm thick, which is slightly beefier than the original. Apart from the tougher metal and some slightly different screw placements, the design is largely identical. We expected that, though, as this year's new iPhones are the regular “S” upgrade that we always get after a new iPhone model, usually arriving with just a few new components. Rumoured changes include a sapphire glass display and a significant camera boost. The Taptic Engine and Force Touch from the new MacBook and Apple Watch are also expected.